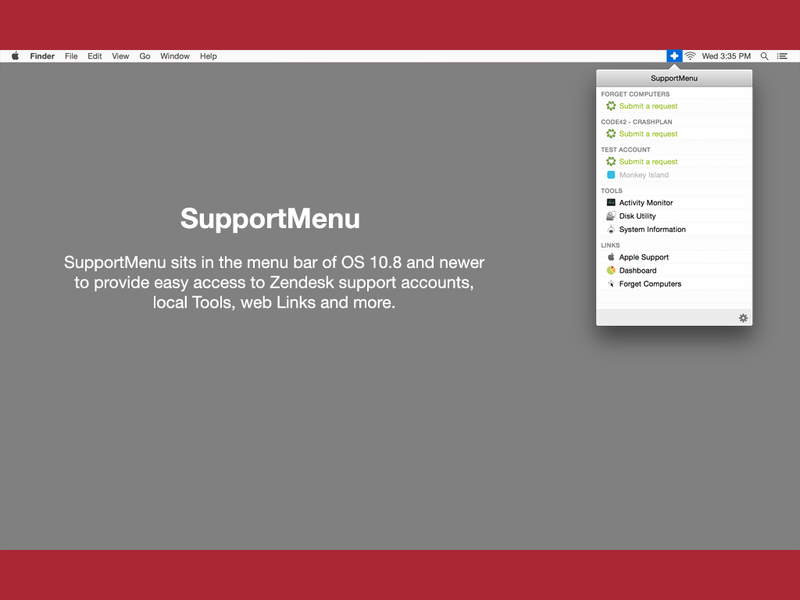 SupportMenu is a Zendesk client app that sits in the menu bar of OS 10.8 and newer Macs (including 10.10 Yosemite) to provide quick and easy access to local tools, web links and more. SupportMenu provides a unified, persistent, completely customizable app that integrates your own support tools into one, easy to use menu bar item. SupportMenu also integrates with Zendesk to increase visibility of open queries, raising support requests above the clutter of email. SupportMenu can be customized to consolidate multiple Zendesk ticketing systems, while providing a simple, quick-access button to various support resources. SupportMenu is a great way to provide end-users with direct access to the tools and communications they need most from your Support Team. PLEASE NOTE: This is an end-user tool and does not include support for Zendesk Agent accounts. Display Open (In Progress) and Pending (waiting a response) Zendesk support requests (tickets) directly in SupportMenu. Notification Center Alerts remind end-users when a request is updated and a response is needed. Fully customizable to fit the unique needs of any office. 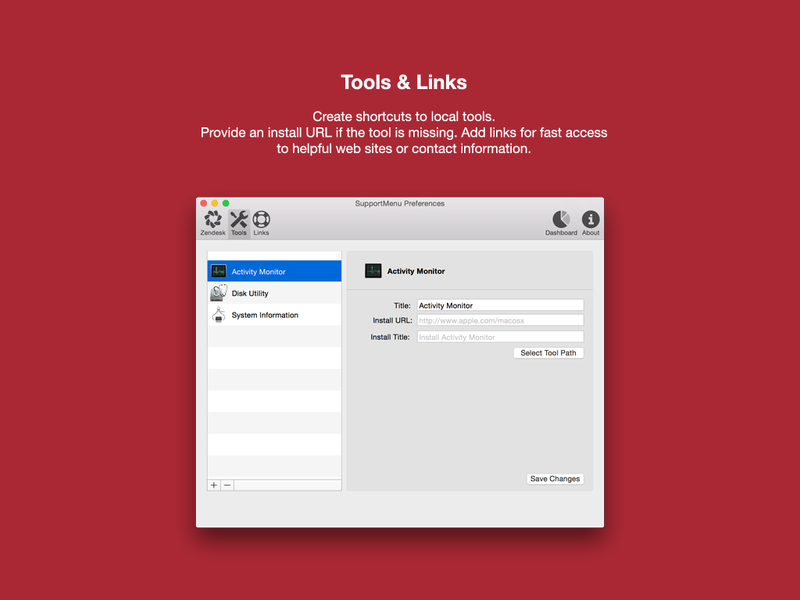 Add custom links to launch helpful web pages (like your Help Center). Add shortcuts to local apps (with a URL fallback if the app is missing). 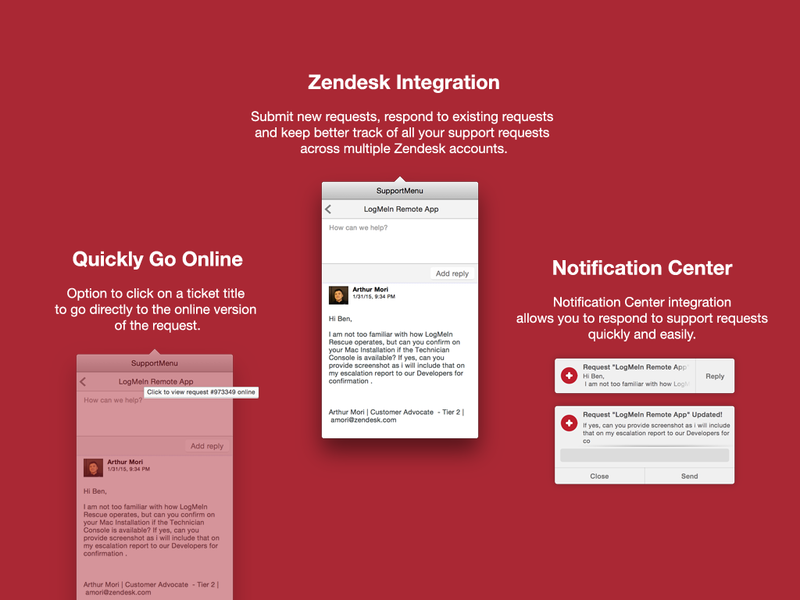 Respond to and create new Zendesk tickets directly from within SupportMenu. Set a default Zendesk account for easy adoption. SupportMenu is available for individuals or small teams from the Mac App Store, and can be purchased directly from Forget Computers for larger installations. Details on how to distribute SupportMenu can be found here.